Stephen “Crash” Crashinsky suffers from ADHD, and all of his life his father has told him what a screw up he is, so Crash is the last person one would ever expect to become a hero. But this is what happens when Crash manages to stop David “Burn” Burnett from blowing up their high school one fateful Monday. Now internationally famous, Crash scores a book deal to tell his story. 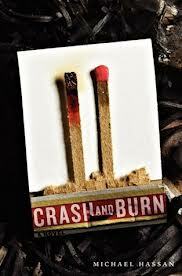 Given his inability to focus for very long, Crash’s narrative alternates between the present summer before he leaves for college and goes back all the way to when he first met Burn in the second grade, detailing the odd relationship the two boys developed. Through it all, Crash parties his way through his days, drinking and getting high with his friends, scoring with girls, and trying to keep out of trouble, a nearly impossible goal. Underage drinking and marijuana usage are prevalent throughout the book. Crash spends most of his time either drunk or high or both. He learns that his father also smokes marijuana. Crash and his friends also use other drugs to get high. Crash’s sister, Jamie, suffers alcohol poisoning after she drinks too much at a party. Crash is constantly looking to hook up with girls. He loses his virginity and engages in several sexual encounters. None are graphically described. David Burnett takes his high school hostage and threatens to blow up the school, killing thousands of students. Crash manages to stop him. David also points a gun at Crash. David suffers from bi-polar disorder and several other mental illnesses. David’s sister, Roxanne, who is also the girl that Crash loves, attempts to commit suicide and is unsuccessful. But later she does kill herself. David’s father was killed in the 9/11 attacks. His mother dies of breast cancer. Crash’s father holds deep feelings of anger and disappointment in Crash because of the problems caused by Crash’s ADHD. Crash is often getting into trouble and his father is very vocal about his disgust in his son. The two fight frequently, and Crash’s father threatens to send him away to military school. Crash’s father has an affair which causes his parents’ divorce.